When businesses integrate the latest in RFID-based smart access control solutions into their sites, they ensure that each and every employee works in the safest environment possible. This technology also prevents unauthorized access to their sites, gaining complete site-specific protection of assets. A safe working environment plays an important part in protecting your employees’ work space, and prevent potential theft of valuable equipment. Access control solutions effectively work to allow selective access to sites or resources, whether it’s employee access to buildings and work areas, or restricted area access to sensitive internal parts of sites. This takes place through a system of permissions, which can be layered according to the level of access given to the employee. The system typically uses RFID readers, cards and keyfobs of varying MHz settings depending on the level of security required. The user’s personal credentials are uploaded onto the RFID tag, whether it’s a wristband, a card or another token. Once the employee scans their tag, their information is matched up with the information present on the business’ internal records, and access is given should a match occur. This makes it easier to track and monitor the employee’s movements in and out of the building and what areas they have accessed, if applicable. 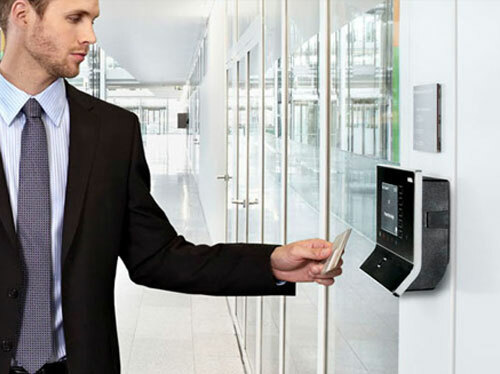 Access control systems can easily be expanded upon to provide managers with information on each employee’s time of arrival or exit from work and their overall attendance. The most common manifestation of this system can be found in turnstiles commonly found at building entrances, and which require an RFID-based card or fob. These can be scanned against an in-built reader inside the turnstile, which allow access to the site, and records details of entry and exit times. The system can be extended to include doorways, rather than turnstiles, in which case an RFID reader is installed on the wall by the door. But access control solutions can also be present in several other ways, including restricting access to parking areas. This is particularly useful for businesses that look to save parking spaces for employees, whilst also ensuring that employee property cannot be stolen whilst it has been left in the car park area. Access control can be used for entry onto information systems, where employees are given credentials such as usernames and passwords. This protects data from potential unauthorized access as well as preventing the theft of sensitive information. Easy to use system : Once an employee has either left or received a new tag, the redundant tags themselves can simply be wiped of their information and recycled. If a tag is lost, the keycard or fob can simply and easily be replaced without having to issue new access cards to all members of staff. This system also makes it a more cost-effective method of tracking and monitoring employees. Easier access restrictions : Most businesses will not give employees full access to all areas of their site, particularly when sensitive information is involved. Instead, access control systems give layered access through the information synced onto the employee’s access card, with each employee given differing access according to their employment level. Protection for products and assets : With only credentialed employees given access to equipment, businesses can rest assured there will be no unauthorized access to valuable assets. As employee movements can also be tracked and mapped, managers gain full visibility of what has been issued to whom and protect against potential theft. Or, through signals picked up by readers installed at regular intervals throughout the building as they move around. Cost-saving measures : Because access control methods can be integrated with other systems present in the building, businesses can save money spent on use of HVAC systems. Employee tag signals can be picked up by RFID readers installed in the room, with the data picked up in turn sent through to the centralized data storage cloud. Once the data is picked up, the system senses if rooms or building areas are occupied or vacant – and the HVAC system is altered accordingly. For more information on the work that New PC Planet does, visit our website.